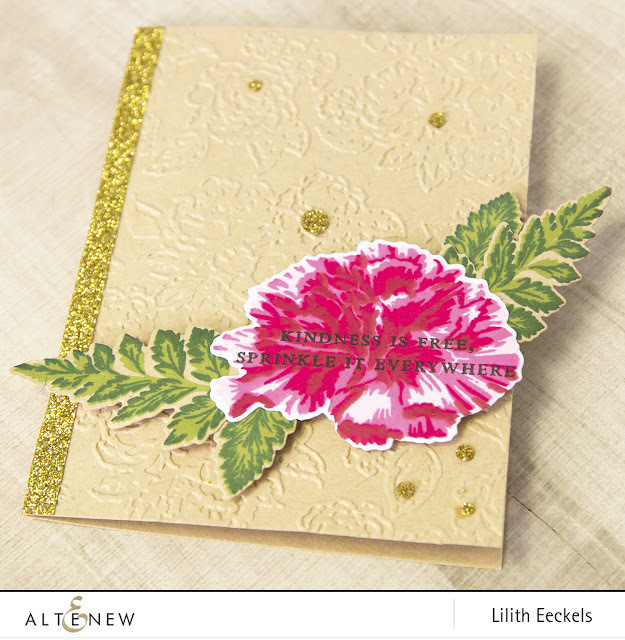 This month's build-a-flower set features a beautiful carnation. The meaning of carnation includes fascination, distinction, and love, and its use in art and decor dates back to ancient Greek and Roman times. With their ruffled appearance and classic beauty, these flowers possess a charm and allure that continues to captivate people around the globe. Alongside the multi-step carnation, we have included two-step leaves, berries, and a cluster of tiny flowers that can be used as filler images for your flower arrangements! 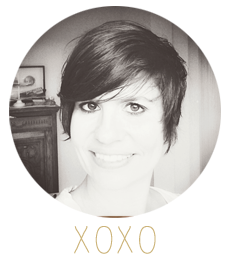 The set also includes three kindness sentiments that are great for any occasion. I love this set and I created two cards with it. I started with a classic design and added some detail by embossing the kraft card base. As I has some leaves left over I thought I'd create a second card. 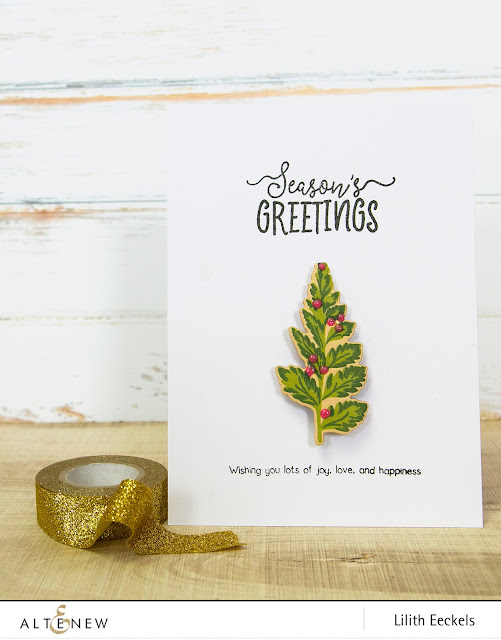 I created a Christmas card turning my leaf into a Christmas tree. 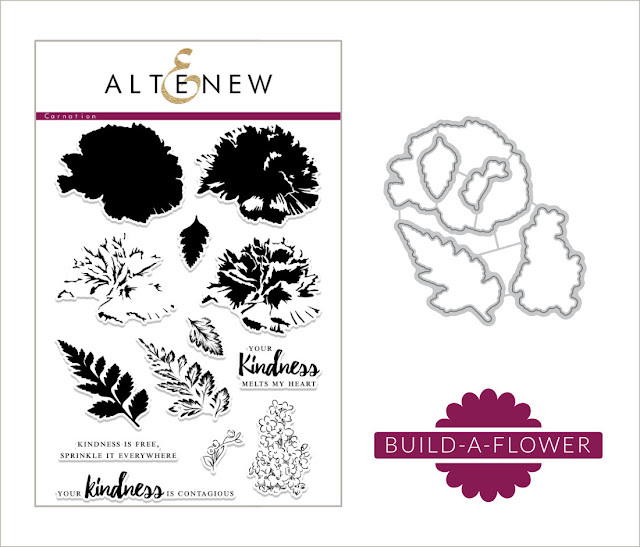 Stop over on the Altenew card blog and scrapbook blog to leave a comment as there are two 30$ gift vouchers up for grabs on both. Leave a comment here on my blog by December 18th and I will draw one lucky winner who will get a 20$ gift voucher to the Altenew Store. I love the look of the layered stamps- they are just so beautiful! Wow Lilith. I really love this red carnation! What colours did you use? Loving how you turned the leaf into such a pretty Christmas tree 🎄! Genius idea! TFS! Amazing details on this set! I love how you've created the Christmas card - the leaf looks perfect as holly! How pretty! I love the dimension on that second card! choice for a cut flower. Love all the dimension on your cards!!! Fabulous cards! I love the textures and colors on your 1st card, and such a sweet holiday card for the 2nd one! Love them both! Beautiful cards! My favorite is the second! Love how you used that for a Christmas card! So striking! I know the floral is the star of the show, but those leaves are lovely. Thanks for the inspiration. Your layered carnation is BEAUTIFUL, especially with the layered leaves and embossed background! Your Christmas Tree card is ABSOLUTELY STUNNING! LOVE the layered leaves tree and ELEGANT design - it is FILLED with WOW! I am really loving your cards. 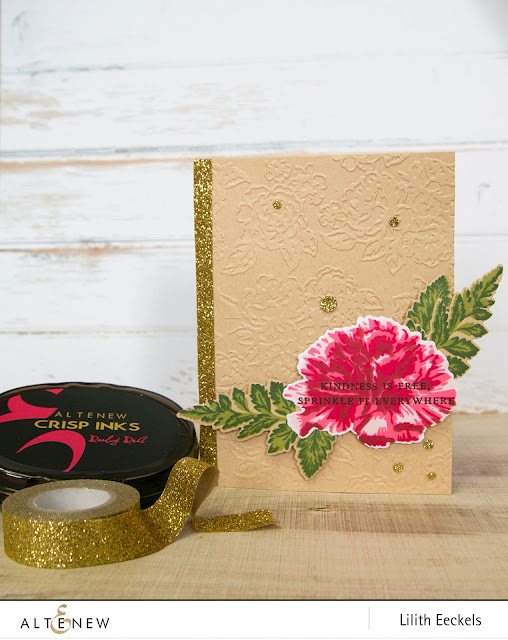 I love the embossed background of card one, it gives such a boost to the card, adding texture and interest. And the 2nd card is awesome. I often see only the flashy stamps in a set and this card reminds me that there is more beauty in these stamp sets than I see at first glance. Thanks for the reminder to look at my stamps differently! Absolutely beautiful and stunning set of projects. loved all of them.. thank you so much for the inspiration..